Just before IBC 2017 Sony launched their new top of the line digital 36×24 CineAlta motion picture camera called the Sony Venice. Sony claim it’s “the next generation motion picture camera system”. That’s a bold claim. Let me go through a couple of the specs of this camera. Daniel Listh shows us a couple here and the article below will go through furter specs. At the end you will find some demo videoes shot with the Sony Venice. 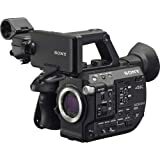 The Sony Venice comes with the industry standar PL mount and is compatible with all Super35 and full-frame PL lenses, spherical and anamorphic. If you shoot with the Cooke/i Technology, lens information is recorded as metadata frame by frame. If you want to use Sony E-mount lenses the Sony Venice has a lever lock type mount (firmware update required). The Venice records internal XAVC, ProRes or MPEG HD recording onto SxS memory card. If you have the AXS-R7 recorder, you can record 16 bit RAW or X-OCN (16-bit eXtended tonal range Original Camera Negative) onto AXS memory card. By using two recording media you can do simultaneous recording which can substatially speed up the workflow, since you don’t have to wait for file conversions.